The 2015-16 operations of Russian aerospace forces and international air force coalition led by the US proved rather effective and noticeably deflated military and economic potential of the leading group of radical Islamists—Islamic State, facilitating liberation of a score of Syrian and Iraqi towns. But today it would be too early to declare the reaching of a tipping point in the struggle against Islamists. A pseudo-state “Islamic Caliphate” created in 2014 by ISIS militants continues to control some regions and large cities in Syria and Iraq, including Al-Raqqah and Mosul. Dozens of Islamists groups from the Middle East, Africa and Asia continue taking oath of loyalty to the Islamic State. Islamic State leaders claim responsibility for large-scale acts of terrorism committed in France, Turkey, and Belgium while threatening to unleash a worldwide “jihad” (a war against the infidels). Political observers and experts clearly see that it would not be enough to employ just missile and bombing raids to break the backbone of the Islamic Caliphate. They argue that it would be necessary to conduct large land operations to defeat the military units of Islamic State and to free occupied territories. However, today Syrian and Iraqi armies are incapable of conducting offensive operations even with the support of international air force. Their military potential was significantly undermined during the years of the civil war. Besides, dozens of small Islamist groups and Kurdish militia units are still acting in the territory of Syria. Apparently, to conduct a successful land operation in Syria to counter Islamic State and terrorist organizations similar to Jabhat al-Nusra, those united troops must join forces or at least coordinate their actions with the government troops. Firstly, the notions of the “front line” and “troops-in-contact” are rather vague. Islamists are dispersed across large territories and are present in towns. They constantly relocate and use civilian population as a human shield. They control strategic highways and oil production infrastructure. They use underground shelters, hospitals, schools, civil buildings and mosques as their headquarters, command posts, communication centers and arsenals. They put out black Islamist flags on all the buildings without exemption and set up hundreds of false targets. They manage to camouflage and hide manpower and combat equipment, strictly observing the principles of communications silence during air raids. Usually ISIS militants attack Syrian and Iraqi government troops only after a rigorous reconnaissance and preparatory works conducted by small mobile troops transported in cars or armored vehicles, often at night. Militants also widely rely on surprise tactics and psychological warfare against rivals and local residents. Secondly, ISIS leaders manage to promptly reinforce their depleted troops, replenish combat equipment, ammunition, logistics supplies and sustain war-making capacity of the military units. 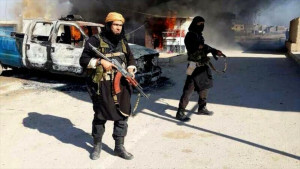 ISIS manpower is reinforced with jihadist volunteers recruited worldwide as well as mercenaries, defectors from the troops of the armed Syrian opposition or from smaller Islamist groups and through the conscription of local Sunni population. Leadership of ISIS does see it morally wrong to recruit women and children as militants and suicide murderers. As for the military, technical, material and financial support, ISIS receives it not only from external sources (intelligence agencies, non-governmental Islamic organization, various Islamic funds established by the countries of the Persian Gulf, Turkey and other countries), but also from its own military and economic activities (salvaging, collection of taxes, exactions, customs, transport and border duties; from robberies, human trafficking, sale of museum artifacts, oil and oil products; smuggling of drugs, weapons, ammunition, etc.). An annual budget of the pseudo-state reaches several billion dollars. Fourthly, leaders of ISIS, drawing on the dogmas of Wahabi-Salafi doctrines of Islam and using advanced information technologies (the Internet, video and audio recordings, special effects, brainwashing, etc. ), managed to embellish the ideology of radical Islam making it appealing to many natives and foreigners. West’s and other countries’ ideological vacuum and corruption of the system of values as well as dissatisfaction of some strata of population with their social position and decisions taken by authorities contribute to the proliferation of these primitive Islamist ideas and dogmas. The pool of former immigrants from the East, who failed to adjust to the European system of values, experience difficulties communicating, unable to find a job or get a degree, etc. presents the most fruitful ground for recruiting new ISIS militants. What’s interesting, though, is that not only Muslims, but also Christians, members of other religious groups as well as atheists from European and other countries get “caught in the nets” of ISIS recruiters. Fifthly, inconsistencies in the Middle Eastern policies of the leading world and regional powers suffocate the struggle against ISIS. Washington and Brussels see their mission in democratization of the region according to the western pattern, and, therefore, in the support of the local opposition trying to overthrow the so-called “authoritarian regime.” From the point of view of the West, Syrian government of Bashar al-Assad is antipatriotic, illegitimate and violating human rights. During the five years of unceasing Syrian civil war, the US and its western and regional allies (Turkey, Saudi Arabia, Qatar and Jordan) heavily contributed to the reinforcement of the armed Sunni opposition. It is a well-known fact that the radical group ‘Muslims Brothers’ represents the main force opposing Bashir al-Assad’s regime. It took Washington and its allies a long time to realize that fighting ISIS and other extremist groups should be a priority. In fact, it was in their plans to allow “jihadists” to overthrow Bashir al-Assad’s regime engaging “moderate” Syrian opposition. They also expected that once this mission is accomplished, “jihadists” would step aside. Russia and Iran maintained close cooperation with the legitimate government of Syria and its leader Bashar al-Assad fighting against the militants of Jabhat al-Nusra from the day one and until the launching of a large-scale land campaign with participation of Russian aerospace forces and Iranian Revolutionary Guard Corps (IRGC). Units of Lebanese Hezbollah and Kurdish militiamen have also made a significant contribution to the struggle against ISIS. However, a general coalition of foreign states was never established, which ISIS leaders used to their advantage. They masterfully adapt their positions in the territories of Syria and Iraq and, despite significant casualties caused by air strikes inflicted by Russian aerospace forces and a loss of captured territories, maintain high war-making capacity demonstrating readiness to defend the regions that remain under their control. Sixthly, UN resolution no. 2249 adopted on November 20, 2015 stipulating the measures of countering of ISIS cannot be fully implemented due to its gross violation by Turkey, Saudi Arabia and Qatar, which continue sponsoring ISIS, Jabhat al-Nusra and dozens of other smaller radical Islamist groups. The United Nations Security Council and its permanent members US, Great Britain and France keep ignoring evidence demonstrated by Russia on the involvement of Turkey in the supply of weapons to terrorists, transit of militants and involvement in criminal business with ISIS and Jabhat al-Nusra. They also are reluctant to acknowledge the facts that “jihadists” receive financial, material, etc. aid from nongovernmental organizations of Saudi Arabia and Qatar. While the world is pondering over the nature of such phenomenon as radical Islam and individual states and coalitions are gearing up for struggle against armed Islamist groups, “jihadists” are steadily moving ahead. They are recruiting new supporters and acquiring high-tech armaments (including missiles and weapons of mass destruction). In addition, there have been attempts of ISIS agents to get inside high-security sites in the EU countries, including, for instance, a nuclear power plant in Belgium.